Harking back to the first page with the cow perfin, I googled 'animal perfins' and found an article in an online issue of the Perfins Club bulletin. It is on pages 10 and 11 of a PDF that takes a while to download. The article labelled it as "French Cow" even though your stamp is from the Netherlands. EDIT: Looking again at the front side, I see that the cow perfin was actually on a French stamp (La Semeuse). Also, doing some more seaching, I noticed that a French stamp (Scott #259) with the cow perfin sold for 26 dollars at a perfin club auction in 2002. Apparently that cow is quite popular, as it is boldly featured in this Perfins of France site. Here are the perfins from the "unchecked" Netherlands mix. Apparently they actually were unchecked for perfins. All but about 3 could be identified by comparing with the pictures on this excellent site. Here are the sources I found in my catalog for your scan #1 of US perfins. From your "next page" scan I found the following additional descriptions in my 1998 catalog. The catalog also has additional information such as period of usage and detailed images of the perfins. Wow thats great butterflies, you sure know your stuff. the Mbar was the one i thought was different. Thanks JohnnyO, Butterflies, for the info on these stamps. I am looking for anything on these stamps and this is a great start. darkormex , Here are two of the stamps you sent me showing the perfin more clearly and the perfined stamp with the city cancel. Having the city cancel for a perfined stamp allows one to sometimes figure out what company generated the perfin, unless, of course the city is huge, in which case a cover with return address nearly always is needed. I first thought the perfin was L/UFE, which is NOT listed in the US Perfin Club catalog, giving me multiple copies of a rarity! Alas, it turned out to be fool's gold. It actually is L/LIFE, (Lincoln Life Insurance Company) originating in Fort Wayne, Indiana and rated E in terms of scarcity. 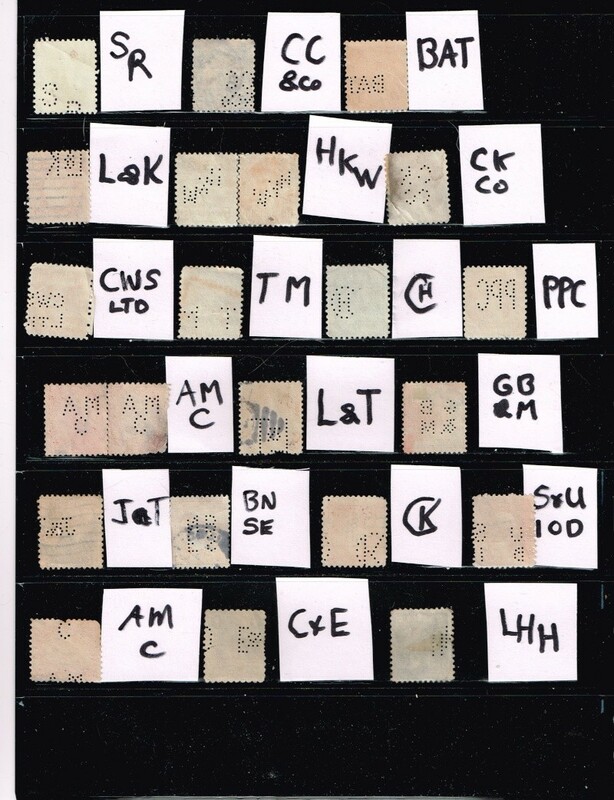 Also of interest, the stamps are all the flat plate printed C12, rather than C16, indicating they were likely all mailed in 1930 or 1931. The only question remaining is why the various numbers in the killer sections of the cancels? EDIT: www.linns.com/insights/stamp-collecting-basics/2003/march/how-to-track-down-the-killers-on-your-stamps.html says "At the center of the cancel was a number, a letter or letters or a geometric shape. These identified the postal worker, shift, position or branch by which or where the cancel was used." I am glad these went to a new home that appreciates them.